So I know it's been some time since I posted here but I've decided to attempt once more to hack Pokemon Red. This time there will be no pressure on a release, I will take my time and who knows maybe a considerable amount will be done within a few months. 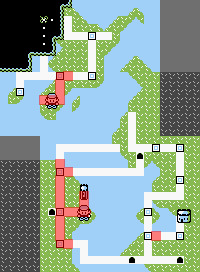 I will release one demo which will feature all of the western side of the map (2 gym leaders and 4 towns). Then the final release. You are thrust into a strange hybrid world where EDM producers and Pokemon are combined. As you explore the land you discover more about the reason you are here and how to get back home. Challenge GYM Leaders who are familiar faces in the EDM world! Capture all the Pokemans as per usual too! - New region that is almost twice the size of Kanto! Welcome to the region of Merino! All the maps will be changed and new maps have been added! Characters from the real world have been thrown into this strange surreal hybrid land. In order for the storyline to fully pan out, new ASM events and scripts have been added for a wide variety of new story episodes and features! Yeah, thats right! Pokemon can now level all the way up to 250 simply due to the length of this game! [TBA] - Demo is 75% finished. This hack sounds great . sounds like a.cool hack lol ^-^ id love to try it but do you have a skype or something i can message you on besides this fourm? cool ^-^ ok lol but i asked about skype because ive heard alot.of.good things about you, i wanted to know if u wanted to help me work on my hack? if ur interested add my skype? Demo is getting closer to being finished. I'd say we're at 65% completion. A little update. The demo is very nearly finished, just got to finish off the last few parts of the storyline. I've also expanded the region so that it's almost twice the size of Kanto. Kool looking hacking! hoping for beta soon. A lot of people, including me, disagree! Your hack looks amazing and I'd love to play it, even if it's not finished! I'm liking what I see here. Can't wait to give the demo a playthrough! So here is a new feature that will be present in this hack. Similarly to "soar" in omegaruby/alphasapphire, you can now fly 'anywhere'. The feature still needs to be ironed out. Eventually when you press fly you will land on the scaled town map on the map where you left off. Also need to figure out how to stop you from flying to places you have not visited yet. This is a very cool feature! Nice job! This is great! Glad to see you're getting more comfortable with assembly.